We arrived in Southampton on a wet and windy day and were met at the airport by an old friend of Paul's, Tim Forcer and his wife Janet. After a quick stop at their home, we headed out into the New Forest to explore an area where Kris had lived as a child. Although it was beautiful countryside, the weather was really bad and we couldn't get out of the car to really explore the area as we had hoped. Nevertheless, Kris recognized some places from her childhood and we stopped at a nice old fashioned pub for lunch. Despite the weather, we enjoyed seeing Tim and Janet for the first time in nearly thirty years and we hope to see them again one of these days. 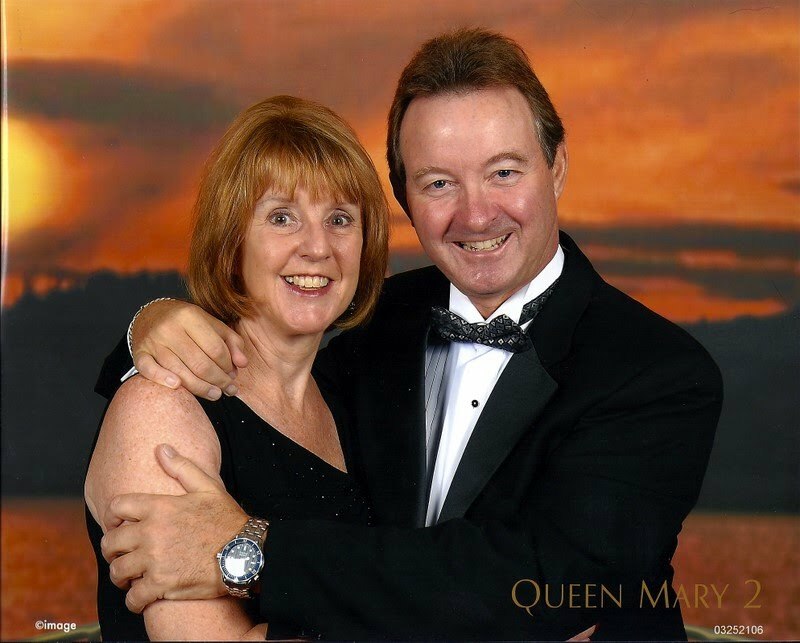 Tim and Janet dropped us at Southampton docks in the pouring rain and we were glad to get on board the QM2 and out of the bad weather. The ship was HUGE - at one time it was the biggest cruise ship afloat although there are bigger ships now. The interiors and public rooms were spectacular - an interesting combination of "traditional" (which for The Queens means Art Deco) and modern / glitzy. The corridors, which ran the full length of the ship, gave a pretty good idea of the interior space. Our cabin (or stateroom) was very comfortable although having a balcony wasn't much of a benefit when we were ploughing across the Atlantic at 25 knots, but it was nice to be able to get a breath of fresh air and see the stars before turning in at night. With six days and night to kill while crossing the Atlantic, eating and dressing up took up a good deal of our time. We were seated with the same people each evening for dinner and found them to be interesting company. One of three formal nights. They take these things seriously on the QM2 ! And of course, there was entertainment, varying from lectures on history to operatic arias. And finally, we entered New York harbor - admittedly at 5:00 am and in the dark, so not quite as spectacular as we had hoped, but still impressive and it wasn't raining ! We were met in New York by an old friend, Debbi Markowitz. Debbi and her husband David live about three hours outside New York in Pennsylvania in a very pretty but rather isolated house surrounded by woodland. David was away when we arrived and returned for the last night of our stay. Debbi and David's house in Pennsylvania. Look carefully, it's a reflection of the house in their pond. Debbi, the domestic goddess ! Debbi took us to visit an old coal mine, which is now open for tours. Although it's well lit and quite comfortable, it was a little spooky to think people had worked there for over one hundred years. Descending (backwards) into the very dark mine was a bit disconcerting and the space in the mine could be very claustrophobic. The leaves were turning to their fall colors when we were in Pennsylvania, something Kris had never seen before, so we will end this blog with a few of the spectacular displays we saw just a few feet outside Debbi and David's house. And with that, we left Pennsylvania and 172 days after we left Orlando, we arrived home. To be greeted by a family of raccoons which had moved in while we were away, but that's another story.